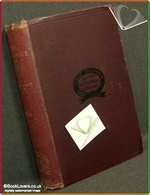 Swan Sonnenschein & Co., 1892, Hardback. Condition: Poor. Heavily bruised at the head, tail and corners of the boards with fading to the spine. Damp marked to the leading edge of both pastedowns and blanks but no further into the text although visible at the bottom corner of the text block. Hinges weakening. Pages lightly age-tanned. The translation of “Cultur der Renaissance in Italien”. Size: 8½" x 5¾". Red boards with Gilt titling to the Spine. In the Half-Guinea International Library series. [XVI] 559 pages. Published by Swan Sonnenschein & Co.